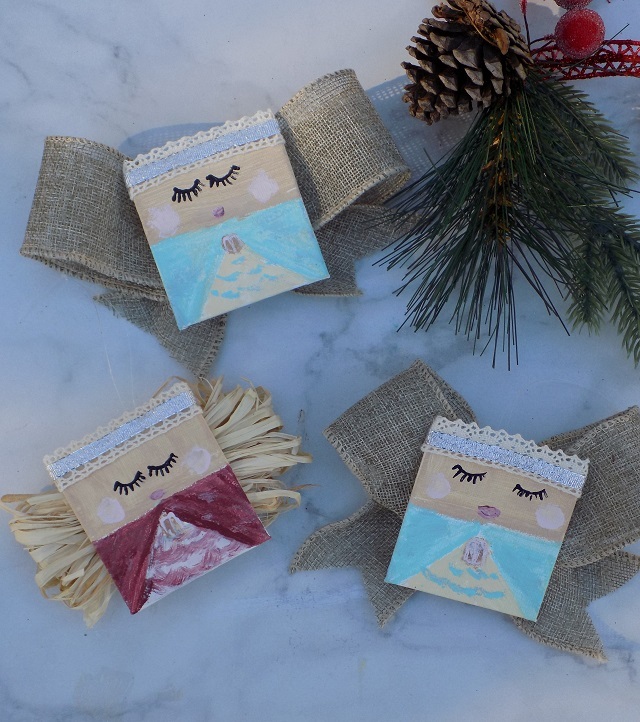 These mini canvas Angel ornaments make the perfect DIY handmade gifts for the holiday season, and they're super simple for young children to put together. If you're on the hunt for an easy kids Christmas craft that results in an adorable keepsake, this is it! Read on for the simple supply list and for our easy tutorial, to make your own Mini Canvas Angel Ornaments with the kids this Holiday season! 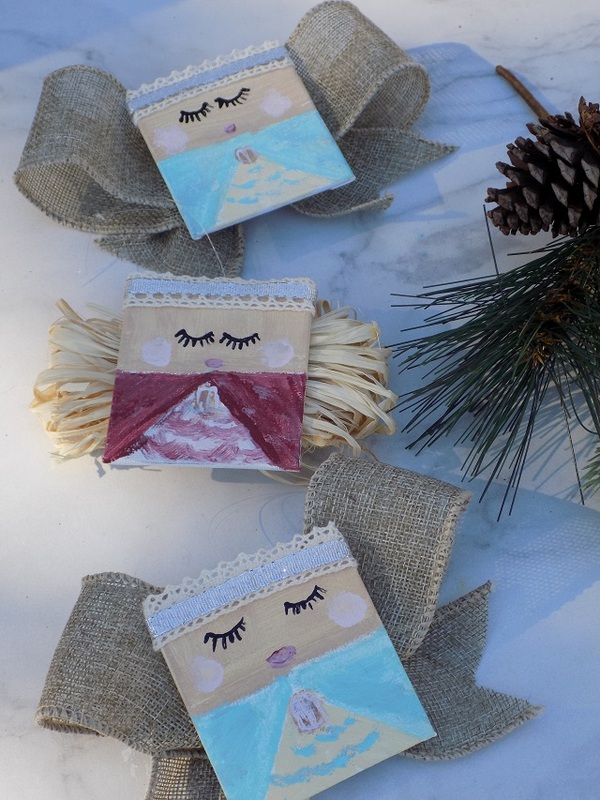 Using paint and a paint brush, paint your angels on your mini canvas. We created a face on the top half, and made her dress / praying hands on the bottom half of the mini canvas. Once complete, set to the side and allow adequate time for the paint to dry. Once your paint has dried, using a few dabs of hot glue, secure your lace ribbon at the top edge of your mini canvas. Next, add a piece of gold or silver ribbon to the top center of the lace ribbon, using a few dabs of hot glue (refer to imagery above and below) to create a halo for your Mini Canvas Angel. To complete your Mini Canvas Angel Ornament, create the wings. If using wire ribbon, make a bow (refer to imagery above and below.) Tie the bow off at the center using a 12" piece of clear thread. Knot clear thread at the top to create a hanger.If using raffia, bundle the raffia, then tie it off at the center using a 12" piece of clear thread. Affix your ribbon bow wings or raffia bundle wings to the back center of your mini canvas using a large generous dot of low-temp hot glue (hold in-place until the glue has dried. Hang your completed Mini Canvas Angel Ornaments on your tree and enjoy, or gift it to someone special this Holiday season. Happy crafting, and Happy Holidays, friends! Nice, these are creative original, and quite easy to make. What a neat craft idea. I love home made ornaments. These are adorable! 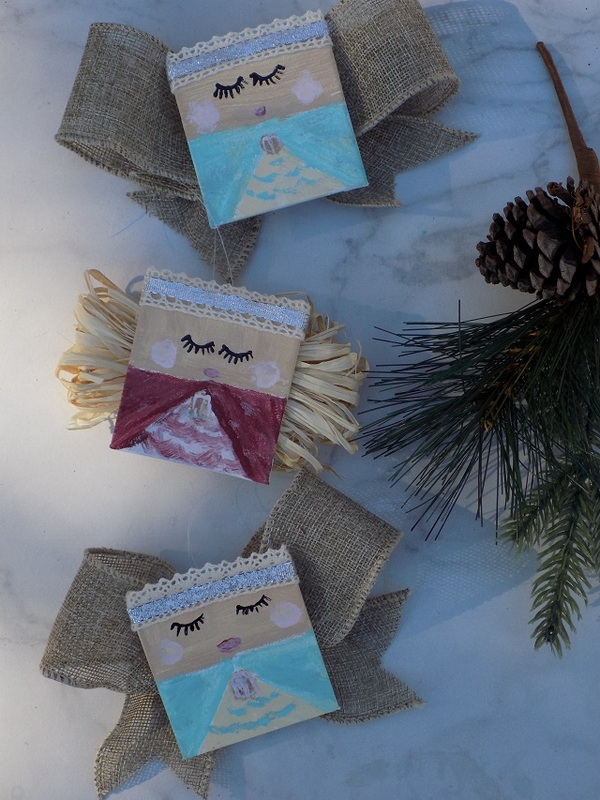 I love having mini get-togethers to make crafts, doing ornaments like these would be fun, and so cute on the tree!